July/Aug 1999 ascent of 4 Alpine peaks over 4,000m including the Matterhorn at 4478m/ 14’777ft. Nov 1999 – Jan 2002 recovering from failed transplant. 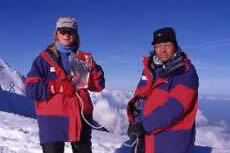 July 2002 - Created a new world record by carrying out the world’s highest dialysis exchange at 4000m on the slopes of Mont Blanc. May/June 2003 we cycled John O’ Groats to Lands End a journey that took five weeks to complete, in that time we covered over 1,100 miles and visited 12 renal units en route. In June 2004 we attempted to climb Mount Toubcal in Morocco. At 4150m it is North Africa's highest mountain. Although I did not reach the summit, I carried out a dialysis exchange at 4050m beating our previous record of the World's Highest Dialysis Exchange. Although we enjoy a great deal of success throughout these adventures, there were many difficulties to overcome.